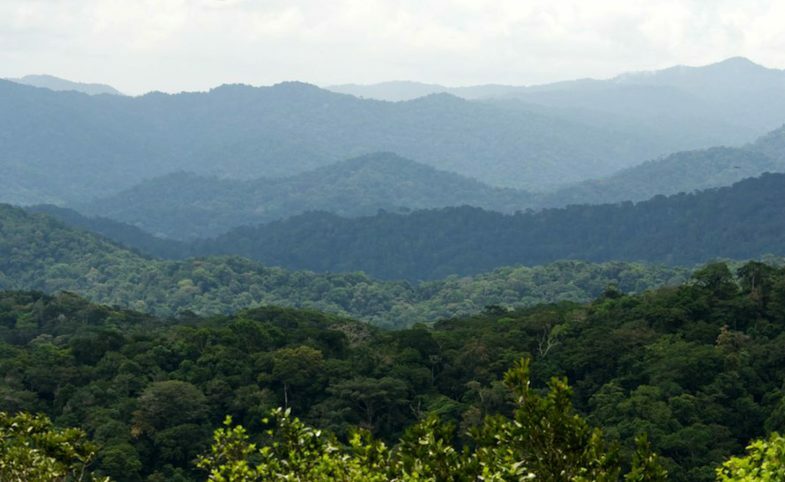 Dissected by the equator, Gabon is defined by the extent of its emerald canopy. Currently, it covers 90% of the country: a vast refuge for gorillas, forest elephants and wily chimpanzees. Join this trekking and packrafting expedition into the Ivindo National Park, and forgo a traditional safari to navigate dense jungle, braided rivers and some of Africa’s most impressive waterfalls. With nothing but your personal kit, a packraft and a paddle in your possession, this opportunity to get stuck in and complete an exploratory mission of epic proportions is yours for the taking. The aim of this epic expedition to Gabon is to explore routes through the seemingly impregnable vegetation of Ivindo National Park via the Mouniandje and Ivindo Rivers. To this end, the team will be armed with packrafts: expedition-strength inflatable boats designed precisely with such intrepid ventures in mind. This expedition is open to those new to rafting, with rivers at times still and flat and at others punctuated with heart-rate-rising Grade One and Two rapids. Rucksacks will be strapped securely onto the packrafts for the paddling phases. When more serious whitewater looms, the team will portage around the rapids, or simply deflate and strap the lightweight packrafts to rucksacks to continue the adventure on foot until the next put in point. Although primarily a packrafting adventure rather than a wildlife safari, along the way you’ll hike into the jungle to visit a remote bai – a clearing with fantastic opportunities for wildlife viewing. 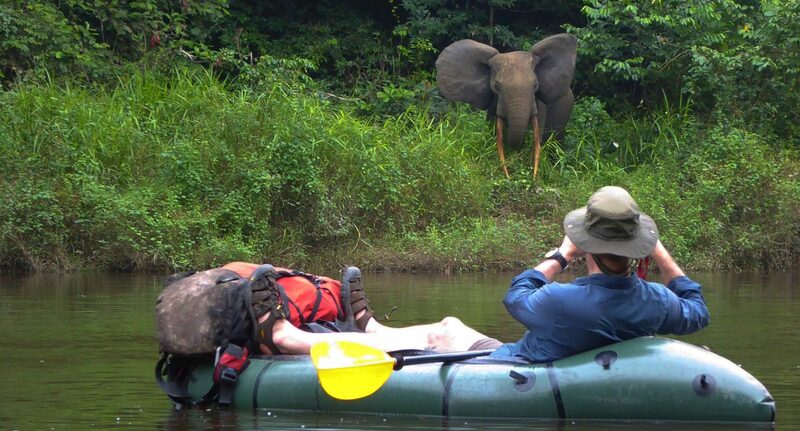 What’s more, the packrafts have proved to offer greater chances of spotting animals along the river’s edge; previous teams have encountered forest elephants, gorillas and countless smaller mammals and birds. Conclude your journey at Kongou falls in Ivindo National Park, arguably one of Africa’s most impressive. Undertake an epic river adventure. Navigate the Mouniandje and Ivindo rivers. Explore Gabon’s Ivindo National Park. Stand beneath the spectacular Kongou falls. Visit a jungle bai and look out for forest elephants, gorillas and leopards. Birdwatch in Africa’s epicentre of forest bird diversity. Travel in local dug-out canoes. “Far exceeded my expectations, I had no idea it would be so wild, so far from any human contact, and really did not expect to see an elephant, gorillas, or a leopard outside of my hammock! I didn’t expect the river rapids to be so much fun. I should have learnt from the Panama trip last year that you guys really know what you are doing!” – David Marsh, 2016 teammate. Despite its wealth of oil resources, Gabon has enjoyed relative stability to its neighbours since its independence from France in 1960. 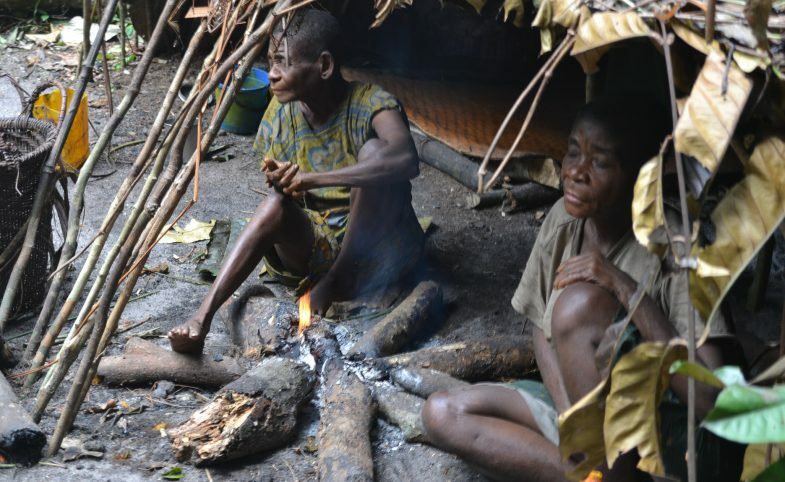 Yet, despite its ambitions for an eco tourism industry, its thriving forests and wild beaches, visitor numbers remain low due to the lack of infrastructure leaving the country largely inaccessible. 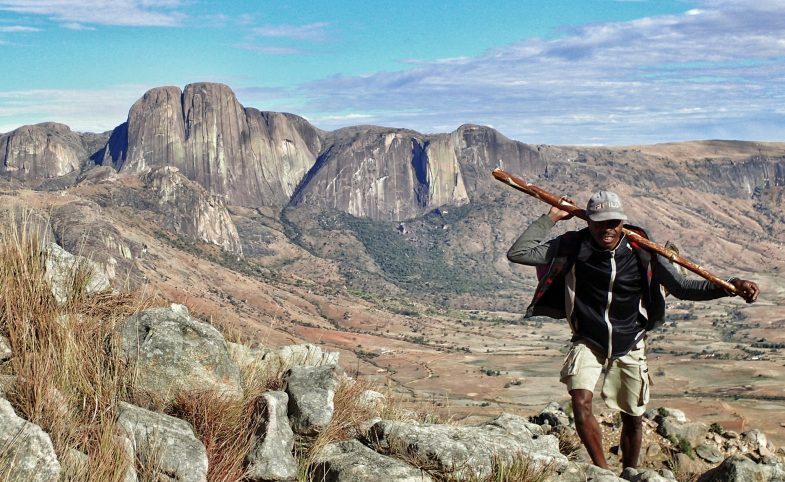 Our expedition takes us out from the regional capital of Makokou, one of the least populous regions of the country and largely uninhabited, aside from forest-based communities. Here, the rivers offer a clear route and an irresistible invitation to venture further into the depths of the forest inhabited by elephants, gorillas, monkeys and a multitude of bird species. Learn to packraft in a truly adventurous setting – or to hone your paddling skills further if already adept. Packrafts are changing the face of adventure travel. Versatile and robust, these expedition-strength inflatable boats allow explorers to navigate remote rivers in a dynamic way. If the rapids become too serious – deflate the raft, strap it and the paddle on your back and continue on foot through the untracked jungle before river conditions are suitable again. Various types and brands of packrafts are available including Alpacka Rafts, which Secret Compass uses alongside Anfibio kit and the Alligator 2S packraft from Germany’s Packrafting Store. Teammates bringing their own kit will receive a discount, get in touch for details. 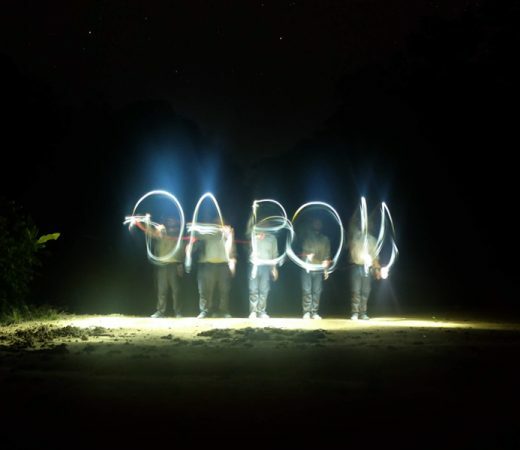 Gabon’s national park network is world-renowned. A team from Outside Magazine visited the area in 2005 and found a ‘wild pristine place, almost untouched by time’. Very little has changed over the last ten years, making this area ripe for rediscovery by a new generation of ambitious and adventurous team members. The country seeks to model itself on Costa Rica, which has turned its abundant natural resources into a successful eco-tourism product. Over 10% of Gabon enjoys protected National Park status, and around 80% of the country is made up of tropical rainforest, with limitations on logging in place to protect this resource. 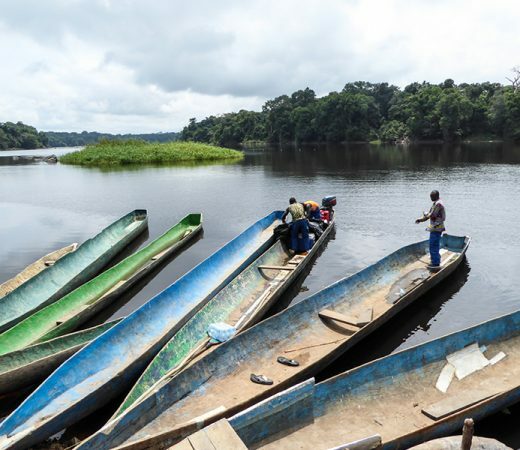 Due to the serious lack of infrastructure for tourism in Gabon’s wilder reaches, tourism figures remain low – making it a great setting for an epic, amphibious adventure of this nature. You will likely have the rivers and jungles all to yourself for the duration of this remote expedition. Well-documented species in Ivindo National Park include forest elephant, bull elephant and primates like gorillas, chimpanzees, colobus and mandril. Buffalo, duikers, bush pigs and giant pangolins might also be spotted. Observing incredible birdlife in the verdant tropical rainforests is highly likely – the region is home to notable species including the grey-necked rockfowl as well as many range-restricted species, and over 400 types of bird have been recorded. While animal and bird sightings cannot be guaranteed and should be considered a plus, a previous team spotted gorillas and elephants within a range of just a few metres. Ivindo National Park (est. 2002) extends to 3,000km squared. It is a natural crossroads of unique ecosystems and biodiversity and is at the heart of Gabon’s conservation efforts. 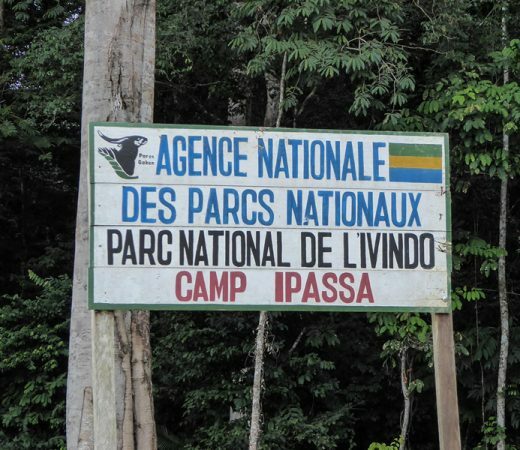 The park contains the Institut de Recherche en Ecologie Tropical, with a research station based in the park that will be visited at the end of the expedition and stayed at for one night. 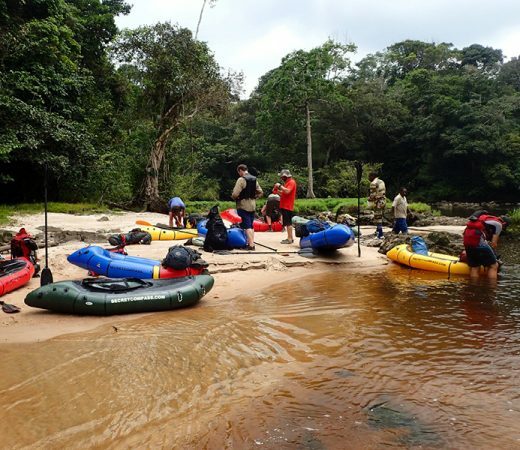 An eco-tourism organisation that is active in the region – and you will travel with its staff in dug-out canoes at the end of this expedition – is the Fondation Internationale Gabon Eco-Tourisme, or FIGET. Its goal is to protect the primary forests of the Ipassa-Migouli-Invindo region. The team will be accompanied by FIGET guides during the expedition along with other local support staff. Secret Compass runs expeditions with framework itineraries, rather than guided tours with set daily plans. Read more about our Approach here. 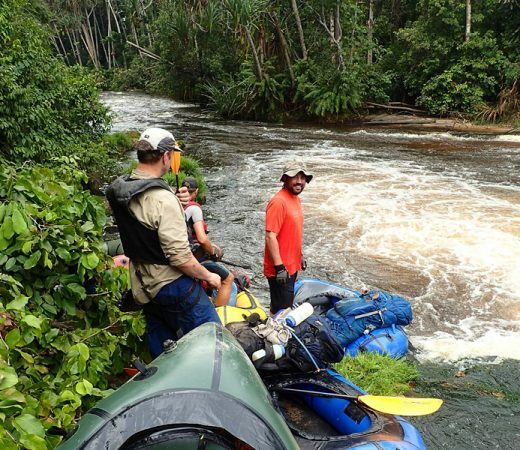 The following is the outline plan for this epic trek and packrafting expedition to Gabon – the ‘substance’ rather than the specifics. A fuller itinerary is provided in the Gabon Expedition Handbook which is available on request or upon application to join the team. All teammates will arrive into Libreville at or before 2300hrs on 6 June 2020. Our in-country partners will handle airport pick ups and drop offs. You’ll meet your leader at a local hotel that night, where the expedition will begin with an official briefing. It’s an early start on day two for a full day’s drive in 4WD vehicles to Makokou, your jumping-off point for the expedition. The next day another early start to transfer to your get-in point on the river Mouniandje for your first day in the pack rafts. Your leader will instruct you on how to use the rafts and off you go, heading towards your first wild-camp on the banks of the river! The next couple of days will see you trek further into the jungle to view wildlife at a jungle bai, before continuing your journey down the river Mouniandje and towards the river Ivindo. Your days on the river form the heart of this epic adventure. You’ll cover 20 – 25 km per day, carrying all of your food and belongings in your rucksack strapped to your raft, from time to time deflating your packrafts and carrying your kit around the bigger rapids. 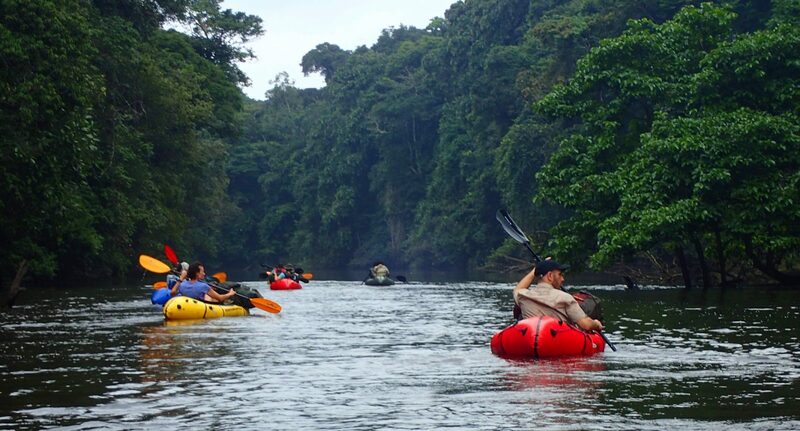 Having explored the Ivindo river, falls and caverns – the expedition draws to its conclusion. Speed back up the river in pirogues (local motorised dug-outs) to Makokou and travel back to Libreville. After a final night at a hotel in Libreville for hot showers and a celebratory team meal, all teammates are free to organise return flights or onward travel at any time from 22 June onwards. The expedition officially ends after breakfast on 22 June 2020 and our local partners will organise your transfer back to the airport for those leaving after breakfast. Secret Compass expeditions are achievable by anyone with a healthy lifestyle and a good level of general fitness. 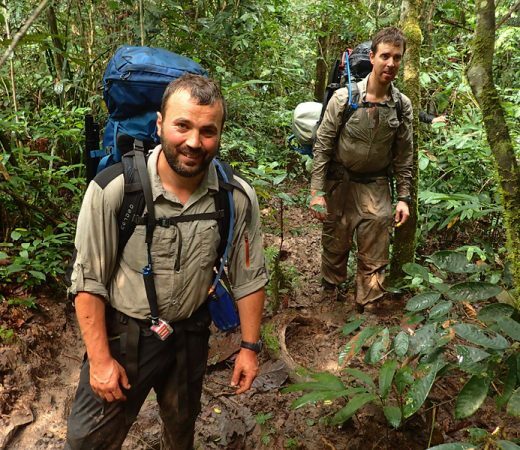 The biggest challenges on this expedition will be the long days of paddling and trekking through dense, humid jungles carrying weight. Applicants will receive a Handbook with further expedition information. View Secret Compass’s suggested Expedition Training Advice and get in touch with any fitness, health, training or kit questions that remain. Raft: paddling in a one-person packraft down fast-flowing rivers for up to 25km per day, negotiating rapids and portaging around obstacles. Carrying: up to 30kg when portaging early in the expedition including a deflated packraft and a share of team food and kit. When hiking to the bai pack weights will be less. Terrain: deal with dense jungle foliage and uneven ground, possibly cutting own paths, wading through swamps or crossing rivers. Can I bring my own packraft? Yes, contact Secret Compass to arrange your discount. Apply for this expedition team using the button below to receive your Expedition Handbook with fuller details. Secret Compass is then on hand to answer any questions or to firm up your place on the team.